FREE STAFF PERMITS - with purchase of parking permits. See details below. FREE STANDARD MASCOTS – With all parking permit types. Use one of our standard mascots. Call or e-mail for additional standard mascot designs not shown. Supply us with a mascot in vector art at no additional charge or we can customize a parking tag with your seal, logo or mascot for an additional $30 -$45. Call for additional colors and quantities. 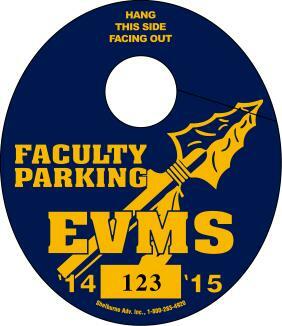 Additional quantities may be purchased in conjunction with a parking permit order in minimum quantities of 100 @ $.90 each. Available in Blue and Black. NOTE: Images are not actual size and colors will vary and may appear different from computer to computer.